The girls' eyes lit up when they saw what I was going to review. They love it when I apply nail polish to their nails. I was only supposed to review the purple one, but when Debbie saw the twins, she decided to send me the pink polish as well. Although the girls love having their nails painted, I don't really want them to get used to it because the ones we have at home are the regular chemical-laden nail lacquers. It's great to know that now they have specially made nail paints for the kiddos. The first ever patented formula of a natural peel off nail polish made with fruits and vegetables. Truly, as natural as it gets!!! 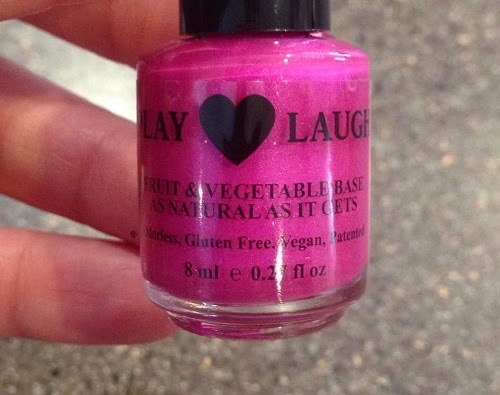 Play Love Laugh Natural Peel Off Nail Polishes, made by Hugo Naturals, is made with carrots, beets, spinach, Acerola cherries, black currents, sugar.....what other nail polishes have these ingredients in them?!?!?!? Though these are safe if ingested, they are NOT made for eating!!! Our polishes currently come in 12 beautiful colors that are extremely quick drying. 2 coats suggested and voila! 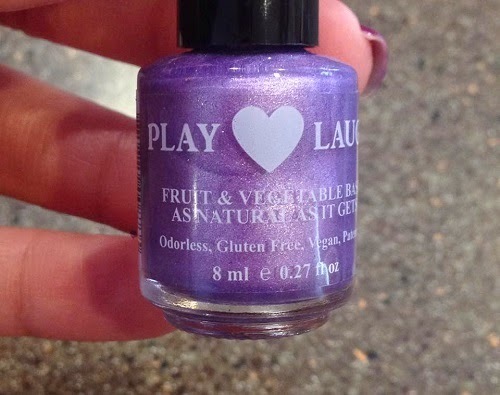 Play Love Laugh polishes are 5- free, odorless, kid friendly, eco friendly, vegan, gluten free, quick drying, animal friendly and safe for pets to use, safe for expecting moms, and NO top or bottom coat needed, NO stinky expensive nail polish removers are needed, and we are free of nitrocellulose/alcohols/acetates/acetones/ethers, and free of FD&C dyes. Completely toxic free, noncarcinogenic, and really completely truly odorless! Though our polishes are WATER PROOF, for removal, all you need is warm to hot water. When you are ready to remove your beautiful nail polishes, run them directly under warm/hot water, or soak them during a bath, and the polishes will soften. Once they are soft, at the base of your nail, lift up like you are taking off a sticker and discard remaining. If your polishes soften but you are NOT ready to take them off, run them under cool water for 10 seconds and they will reset. Depending on lifestyle, longevity on toenails ranges from 7-30 days (average 14 days) and again, depending on lifestyle, the longevity on fingernails ranges from 1-7 days (average 4-5 days). These amazing, safe, gorgeous natural nail polishes were created by a mom, of 3 young children, who is a Certified Physicians Assistant and a Registered Nutritionist. She created them for her children and for herself to use because there is not anything on the market as safe, as natural, as easy to use, as smooth, and as beautiful as Play Love Laugh nail polishes. She is very excited to share with all women and children who care about their health and beauty. The colors sent to us were really nice and they are unscented. I was expecting it to smell something like food or fruit since most of the ingredients used are from fruits and veggies. It has a nice consistency and very easy to apply. It glides pretty smoothly and it dries up quickly as well. It's just like a regular polish that hardens when it gets dry. With our twins who love to play with anything using their hands, the polish lasted more than 7 days on their nails. Removing them is fairly easy as well. We just soaked their hands in warm water and peeled them off when the nail paint softened. Overall, we had so much fun and the girls love them. 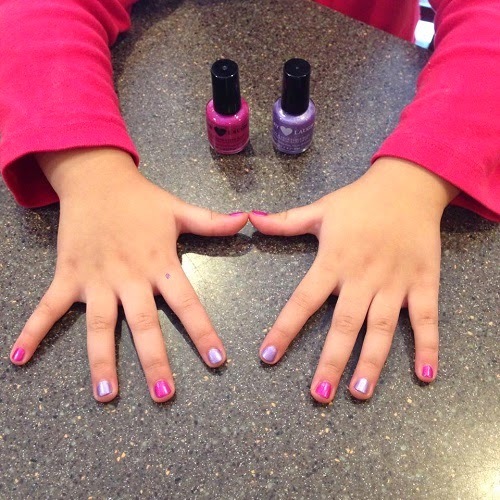 If you have kids who love to get their nails painted, the Natural Peel Off Nail Polish is a perfect choice. 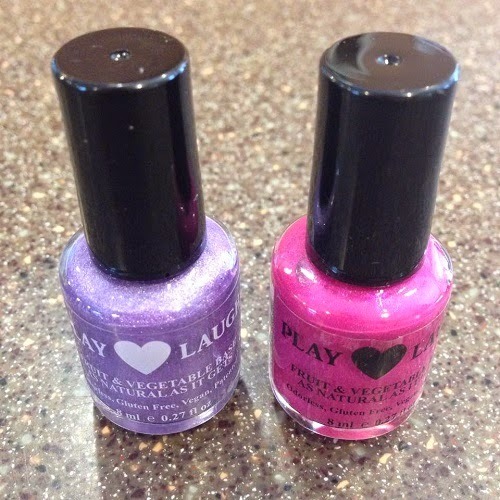 You can purchase the Natural Peel Off Nail Polish through the Play Love Laugh website. I am also giving away one bottle of nail polish to one lucky reader. Really Teally Fun! Thanks for the chance! I love the Pink Rose color! These are so cool! I love Merry Berry Berry. I liked Rosie Posie for my granddaughter! Thanks for the chance!! These are wonderful! We love Orangecicle. Thanks so much!